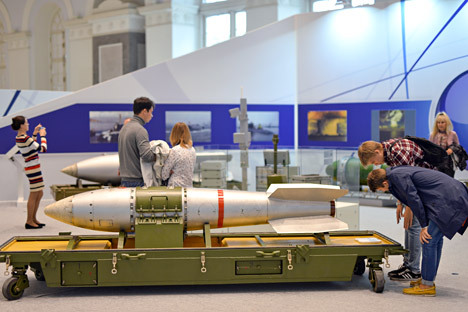 A small-size free-fall bomb with the RN-28 nuclear warhead dating to the 1960s on display at the exhibition "The nuclear industry turns 70. The chain reaction of success." All three countries improved nuclear security. According to the Nuclear Security Index (NTI), developed biennially with the Economist Intelligence Unit (EIU), Russia has improved its nuclear materials security conditions. As the 2016 NTI Index shows, Russia, the U.S., India, and the UK have become the most improved nuclear-armed states in terms of nuclear security. The NTI Index assesses the security of the world’s deadliest materials, including highly enriched uranium and plutonium, based on two sets of data – theft ranking and sabotage ranking. Nuclear security is a much-discussed topic at the moment. The 2015 Review Conference of the Parties to the Treaty on the Non-Proliferation of Nuclear Weapons (NPT), which was held in New York and lasted almost a month, was unsuccessful: the U.S. and their allies vetoed the final document of the Conference at the last minute. The stumbling block was the question of ridding the Middle East from Weapons of Mass Destruction (WMDs). Russia and the Arab states suggested that the talks on the issue begin within the year, however, the U.S. took the Israeli side by proposing a number of prerequisites for participation in this process.